Verbalize understanding of the cause of the problem. Identify signs/symptoms requiring medical follow-up. Follow the therapeutic regimen and demonstrate lifestyle changes if necessary to prevent recurrence. Ascertain pathology of the individual problem. Information reduces the fear of unknown. Provides knowledge base for understanding the underlying dynamics of condition and significance of therapeutic interventions. Determine the likelihood for recurrence and long-term complications. Certain underlying lung diseases such as severe COPD and malignancies may increase the incidence of recurrence. In otherwise healthy patients who suffered a spontaneous pneumothorax, incidence of recurrence is 10%–50%. Those who have a second spontaneous episode are at high risk for a third incident (60%). Reassess signs and symptoms requiring immediate medical evaluation such as sudden chest pain, dyspnea or air hunger, progressive respiratory distress. 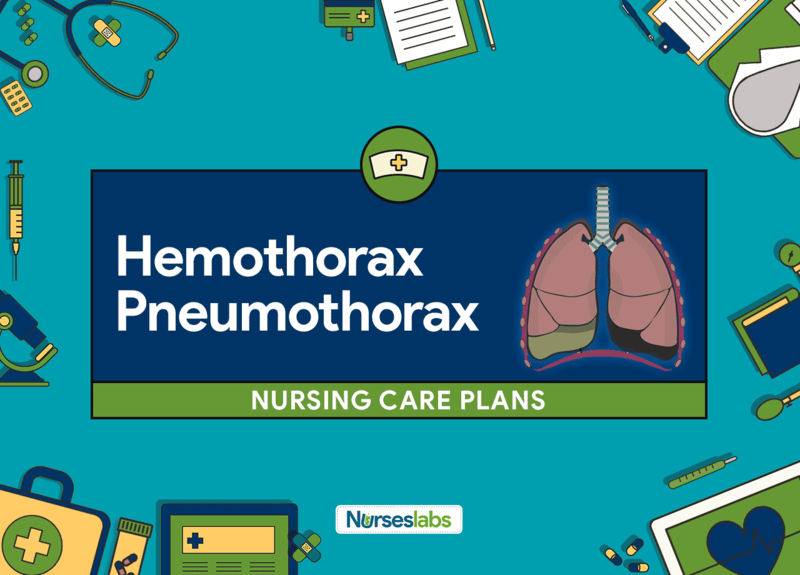 Recurrence of pneumothorax or hemothorax requires medical intervention to prevent or reduce potential complications. Review the significance of good health practices (adequate nutrition, rest, exercise). Maintenance of general well-being promotes healing and may prevent or limit recurrences.